First of all, I must send some Happy Birthday wishes to my brilliant puzzling friends Allard and Frank who (Thursday and today respectively) have both had VERY big birthdays - catching up with me to become very old men! I hope you both had great days and maybe a puzzle or two was received to commemorate the landmark? 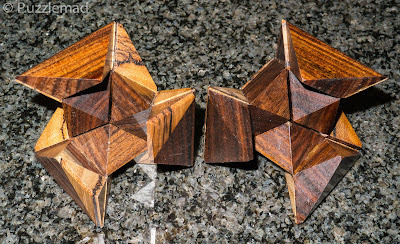 I wrote about the star and some of the variants back in 2012 and since then have added more to my collection. 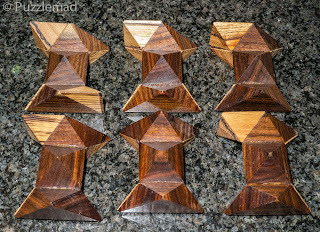 Amongst the many variants of the Diagonal burr are the Triumph, Fusion confusion and Triumph companion series as well as the Augmented square face which I bought several years ago from Scott Peterson as well as the Second stellation bought from Brian Menold (have you seen his recent puzzles by the way?) 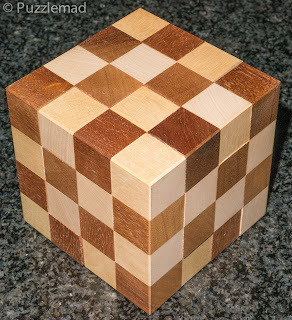 Last year I also admired the diagonal cube made by Big Steve on his 3D printer and he was kind enough to give me a copy which I duly solved (after quite a bit of swearing and a few laser burning stares) and then tortured several med students at work with it (I cannot seem to find the photos just now). I have been looking for a wooden version for some time and was very excited when I saw the copy that Rob had bought. After a few emails I had established that Andrew was making a few more copies and he'd let me know when they were ready. 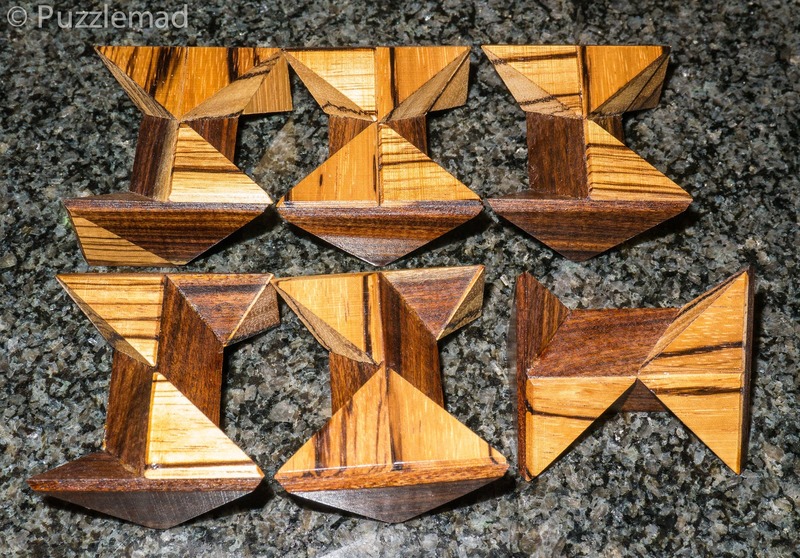 They were stunning and I couldn't resist the one with Zebrawood and Walnut and some PayPal was moved across the pond. After a week or so another package arrived chez moi much to the annoyance of Mrs S and the above beauty was inside. It is surprisingly heavy! As usual I left them like this for an hour or so to make sure that I had forgotten the positioning completely (who am I kidding? I barely remember who I am so there's no way I will remember minor details of grain and diagonals!) After dinner I balanced all the pieces on a slumbering (and dribbling) cat and set about the reassembly. This puzzle is different to most of the other star variants in that there is only one assembly that will go all the way. The Triumph trio will make lots of interesting shapes but only one has the correct colouring of the pieces but the Diagonal cube requires each of the 2 halves to be assembled correctly before putting them together. 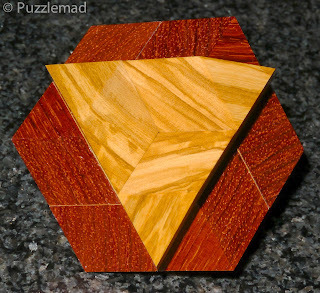 This is also a dexterity puzzle as they have the tendency to fall to bits as you pick them up, swivel them around, reorder the partial assemblies, or even look at them too long! To my shame it to me over an hour to get my cube back to shape but at least I refrained from swearing too much and receiving another burn. 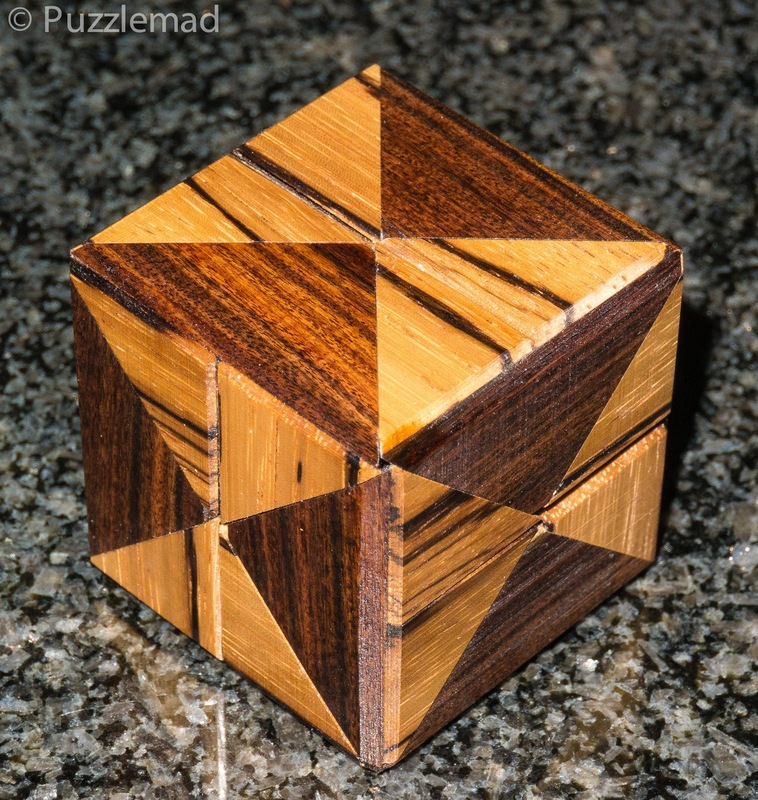 I have solved it 3 or 4 times since then and interestingly, do not seem to be getting any quicker at it which probably is a reflection of how dim I am more than how difficult a puzzle it is. I have to say this is a wonderful puzzle that in some form should be in every puzzler's collection - it looks beautiful in wood and is a great challenge suitable for beginners and experienced puzzlers alike. 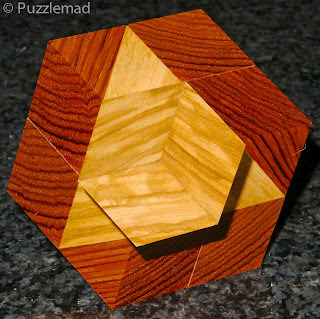 Andrew put a few other puzzles up for sale at the same time as the Diagonal cube. I couldn't buy just one could I? 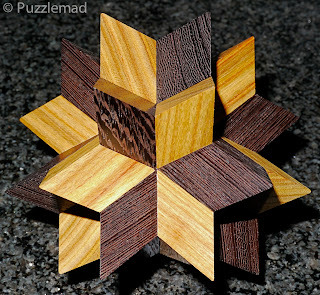 I resisted buying one of everything (Mrs S would have murdered me) and I bought a copy of the most eye catching puzzle he had made. 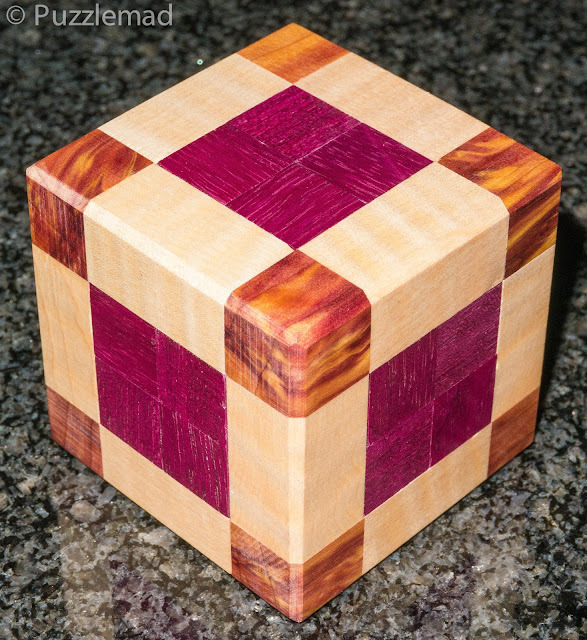 The picture is of Locked Cube III made from Purpleheart, Maple and what looks like Box Elder in the corners. 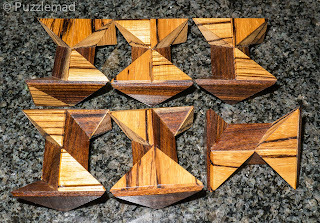 I am not sure whether this is Andrew's own design but I am a sucker for interlocking solid puzzles and have really enjoyed playing with this. It is also significantly heavy and when tilted rattles quite a bit. This is nothing to worry about because there are ball bearings inside which make the disassembly and reassembly more challenging. 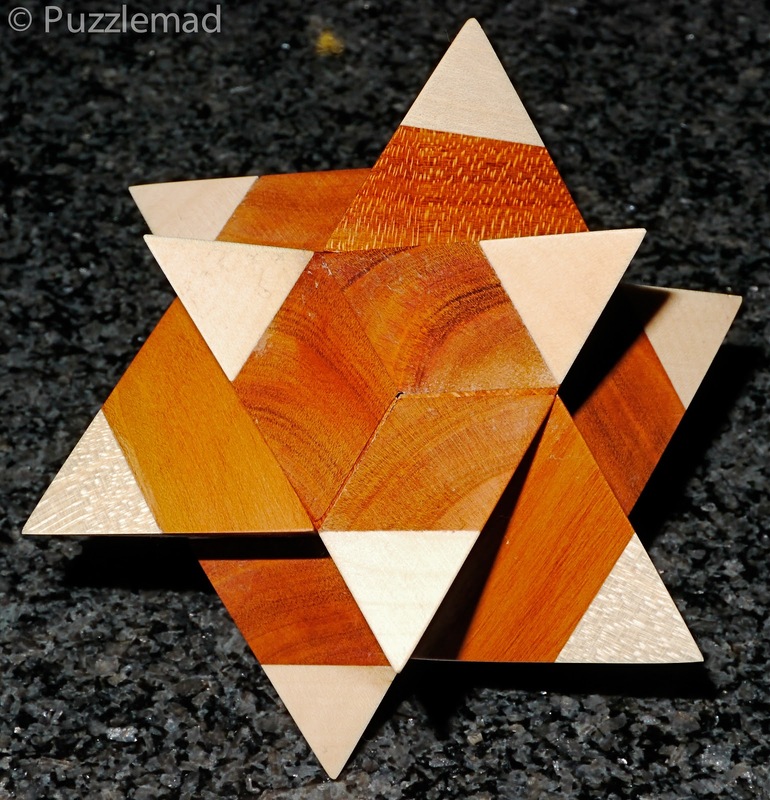 I own one other similar puzzle - the King's court made by Pentangle many years ago. 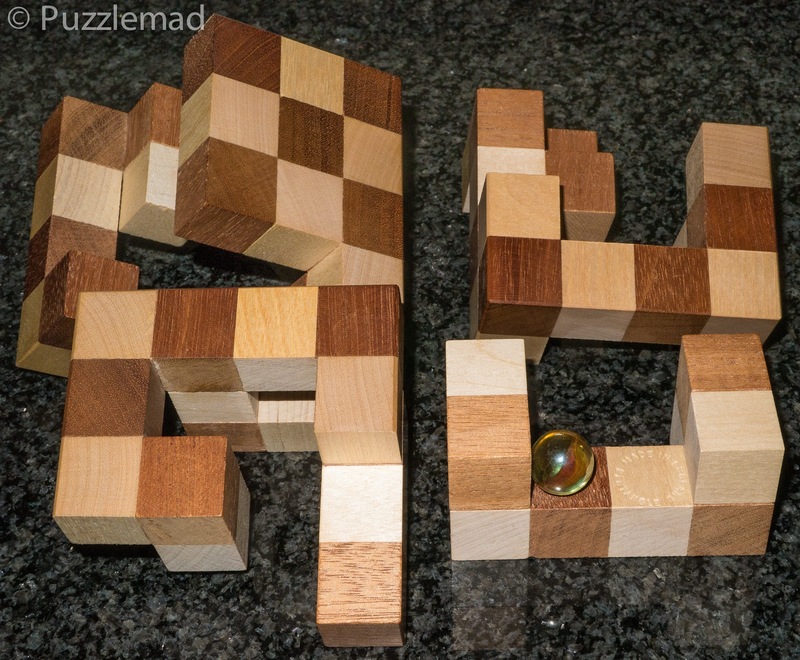 It also is a 4x4 interlocking cube with a marble inside which requires variations in the positioning to manipulate the ball to allow the puzzle to be taken apart and then again to reassemble. I couldn't resist another one of the same type! 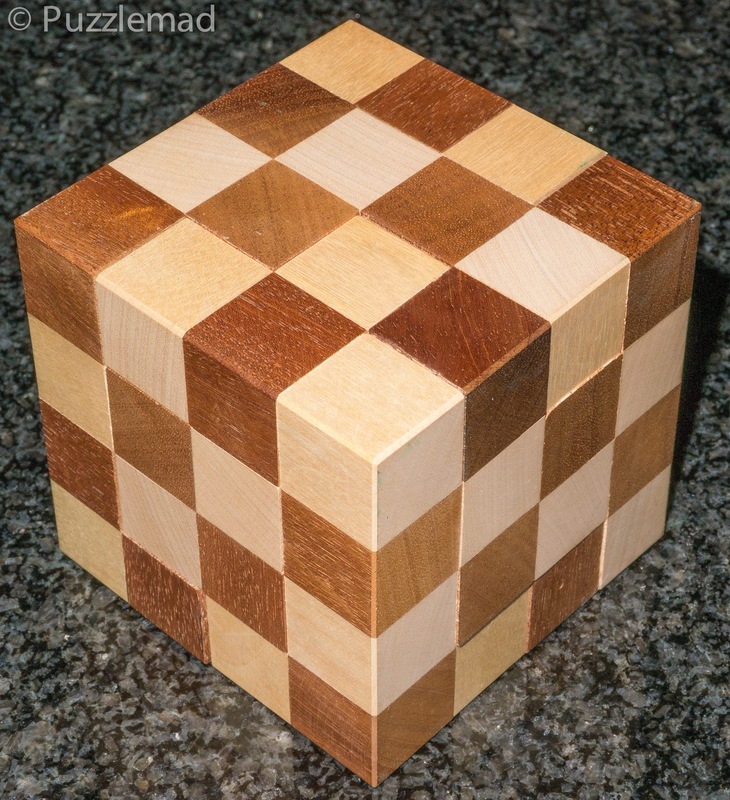 When I set to work on the Locked cube 3, I expected a similar experience but this quickly established itself as a tougher puzzle. The pieces seemed to lock more than expected and required absolutely specific orientation before another move was possible and when I took my first pieces out I was a little perturbed when not one but 3 ball bearings dropped on the cat and rolled under my foot stool. To ensure that I definitely forgot what I had done, the cat had not stirred at all despite the bearings dropping on his head. He was sound asleep and I didn't have the heart to move him to retrieve them. 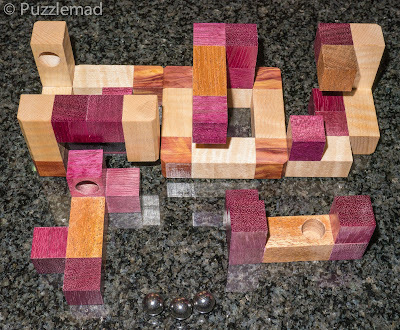 I was forced to put the pieces down and wait until he got off before I could get the errant balls. In fact he got off at my bedtime so I was forced to wait until the following day before attempting the reassembly. 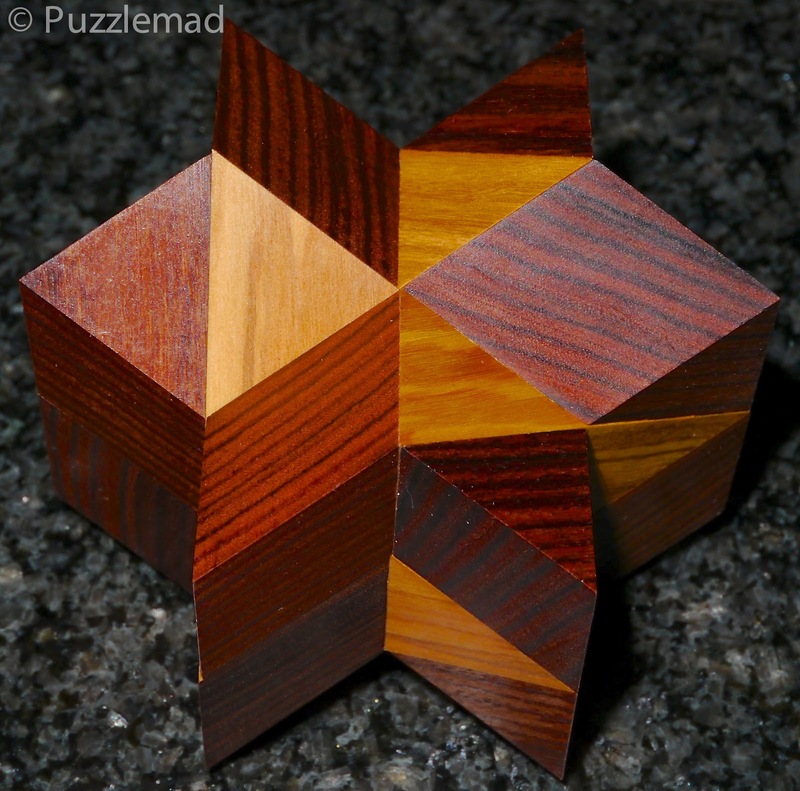 It is a very nice logical sequence which is not too difficult and well worth the small amount of money this puzzle cost me. I will need to try and get copies of numbers 1 and 2 in the series too. 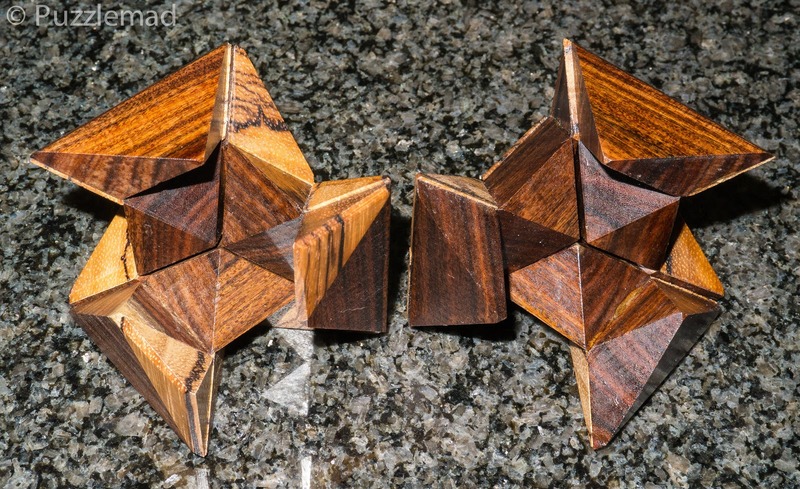 I suggest you keep an eye on Andrew's Etsy page to see what he brings out - you really won't be disappointed. 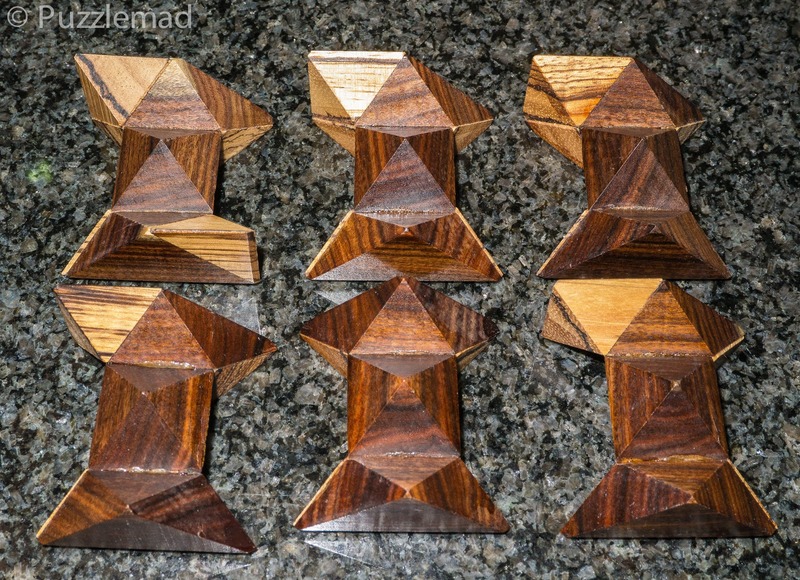 They all look fairly similar but all have rather different solutions and are delightful to solve as well as to look at in a collection.